The Village has a cell phone program for senior citizens. This program provides used cell phones to senior citizens who meet the current eligibility requirements. The phones are only able to dial 911, and are to be used only in an emergency. We also collect old cell phones for the program. Senior citizens, 60 years old and older, who are unable to get out to shop for themselves due to physical limitations or who are simply unable to drive, can receive a hot lunch delivered to their home. 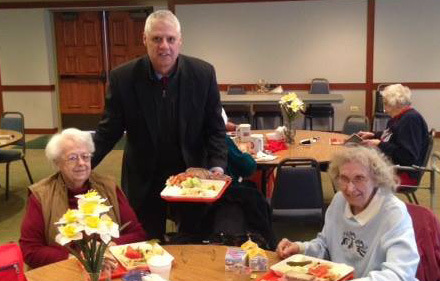 The Program not only provides a hot meal, but it also provides a well being check of the senior every weekday. The Meals on Wheels Program provides a hot lunch five days a week, delivered between 10:00 AM and 2:00 PM. A spouse or caretaker living in the household can also qualify even if they are not 60. In addition, frozen meals that can be easily prepared on the weekend, are available. The Meals on Wheels Program works in partnership with West Suburban Senior Services (WSSS) and conducts a background check on their drivers, many of whom are Village of Franklin Park employees. The cost of a daily meal is a suggested donation of $3.25-$3.50, but anyone in need of the program should apply. 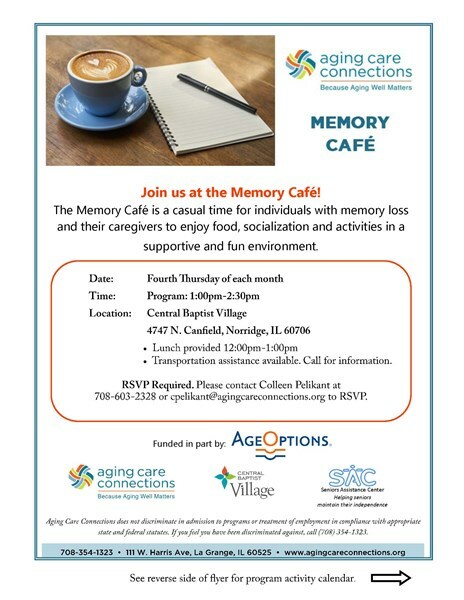 To learn more about the program, please call WSSS at (708) 547-5600 or contact Meals on Wheels at (847) 678-8777 to sign up. The Cafe at the Centre at North Park Hosts Daily Lunch for Seniors. The Franklin Park Community Cafe is open to all seniors, age 60 and over, and serves a daily hot meal at 11:30 AM, Monday through Friday, at an affordable price. The Cafe is located at the Centre at North Park, located in the Park District facility at 10040 West Addison, and most days it also includes an optional Soup / Sandwich / Salad Bar. The Cafe opens at 9 AM and closes at 2 PM and features daily Bingo! In addition, the Cafe schedules movies, guest speakers, Health Fairs, Day Trips, parties. It’s a great place to get together with friends and neighbors over a cup of coffee. For more information, call (847) 678-8777, or stop by to pick up a menu for the month. The suggested donation is $2.75 - $3.00. Your first lunch is always free! This program is part of Cook County’s Community Nutrition Network. New forms for the current tax year are available for the Senior Freeze Exemption and the Senior Homeowner Exemption from the Cook County Assessor's Office. More information is available at www.cookcountyassessor.com or by calling (312) 443-7550.